Quality of plants and crops growth depend greatly on physical and chemical properties of soil, that is on soil composition: minerals and organic matter, water, gases like oxygen and carbon dioxide and living being (primarily microorganisms such as fungi and bacteria). Soil is not only a support system, but also a nutritive source that supplies plants with water and nutrients. Each plant needs a particular soil composition, in which it can better express its potential growth. For this reason, a correct balance in soil components is fundamental to ensure an optimal crop growth. The most important elements for plant growth are nitrogen (N), phosphorous (P) and potassium (K): for this reason they are called essential nutrient elements or macronutrients. These elements are usually added to the soil by fertilization. Other elements, the so called microelements are generally present in sufficient quantities in the soil and the plants need them in smaller doses. 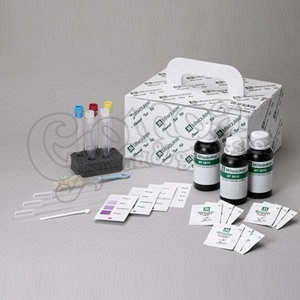 Milwaukee NPK Soil Test Kit allows to measure the concentration of the three elements N, P, K in a soil sample. A table at the end of this manual shows N, P, K requirements for common crops and plants.